The Bramble Patch Running Stitchers are back! In 2017, our Running Stitchers team of Bramble Babes Alicia, Emma and Tracy impressed us all by running the Birmingham Black Country Half-Marathon to raise funds for Macmillan Cancer Support – they trained hard, ran well and donated £1,285 from friends, customers and Bramble Patch. In 2019, the Running Stitchers team is tackling another 13.1 miles on 24 March – the London Landmarks Half-Marathon – and this time they will be raising funds for Alzheimer’s Society, our new official charity. We do hope many of our customers and friends will join with us to kick off our efforts to support a charity whose vision is a world without dementia. Tracy is head of our experienced long-arm quilting Babes and is no stranger half-marathons (last year alone she ran three of them) and is in fact using the London Landmarks as final preparation for running the famous London Marathon in April. Yes, that’s the whole 26 miles! Tracy is well into her training so by the time 24 March comes round, we’re sure she’ll breeze through a mere 13.1 miles! Alicia needs no introduction to most of you as our Bramble Clubs Babe and EPP queen. She only started running in 2017, but has run four half-marathons in the last year and is feeling the need for a new impetus after the disappointment of not getting a place in the London Marathon with Tracy. Alicia has decided that all of 2019’s runs will be about creating or celebrating memories in locations with a personal significance – and it all kicks off with the London Landmarks for Alzheimer’s Society. 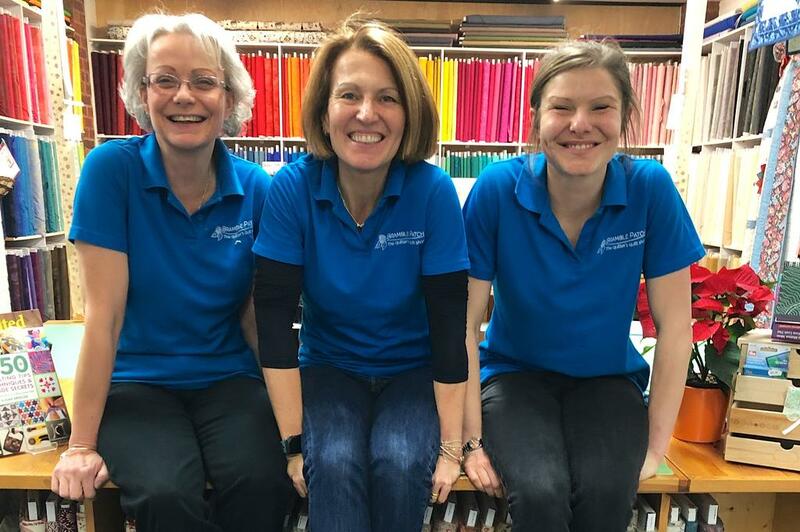 The Running Stitchers have made a commitment to Alzheimer’s Society to raise £2,200 from their efforts so Bramble Patch are asking family, friends, customers and fans to sponsor them in support of the fight against dementia. Please donate via the team’s Just Giving page: the Running Stitchers. After the generosity of everyone in 2017, this time we’ve come up with a special thank-you for our best supporters – the brand-new Quilt Down Memory Lane Club. As a thank-you for donations of £25 or more, we will subscribe you to our new Block-of-the-Week Club. Each week we’ll email you a pattern for a 5” x 5” patchwork block that can be hand or machine pieced. There are 53 different blocks and with a simple border, you’ll have a unique lap quilt (approx 60” square). The project is suitable for using up scraps or making a dent in your stash; or, if you prefer we can help you choose fabrics or put together a bespoke fabric pack for you. Just let us know when you’ve made your £25+ donation and we’ll add you to the Quilt Down Memory Lane Club.